On Wednesday the guys wanted to do something new and check out the Durance Gorge. However you need good water levels which are dependent on a dam just before the Gorge. According to the book this is a nice section with a class 5 portage to get around an unrunnable section with a good head for heights. As I don’t have a head for heights I would enjoy myself at the Slalomsite of L’Argentiere. Driving up the road the Durance seemed low and getting at the dam there was not enough water coming through. As we found out later, all rivers around Briancon had low water levels. The plan quickly changed to check out the Upper Guisanne and maybe do the Lower afterwards. After a small picknick on the put-in and seeing massive others putting in, we knew it would be a busy day on the river. One section called the S-bend should be inspected according the book, but we decided we would just run it. With the really low levels it was a rocky bouncy ride, but not much pressure so a lot of time to just steer in the correct direction and sometimes just over everything as there was no correct route with this water level. An hour later at the takeout the whole bank was filled with boats and cars, looking at some car crushers that would pickup cars across the parking lot. We met some guys from Big Dog we had seen the day before. After some talking they decided to join us for the Lower Guisanne. Bob in his OC1 and Tom in his Big Dog DropZone. Bob would compete in Plattling at the World Championships a week later as would Johan and Thomas. We portaged some unrunnable or unsafe chutes and had a bit rocky ride till the takeout. With a bit more water this would be a nice section to run, not as difficult as the Guil but nice. Thursday morning we discussed the options of either the Ubaye with La Fresquiere or the Middle Guil with the Guardian Angel Gorge together with the Brits. After a lot of back and forth, it turned out to be the Middle Guil. As I was really tired I decided to drive along and make pictures at Triple Steps, Chateau Queryax and the cataract. Bob had lended his boat to Eli, another OC1 competitor in Plattling, for the Chateau and Guardian Angel Gorge. Apparently the flight and travel had some impact on Eli as he swimmed some parts and Bob said he had never seen that before. The Gorge was great though and saw a lot of happy and smiling faces when they got out. 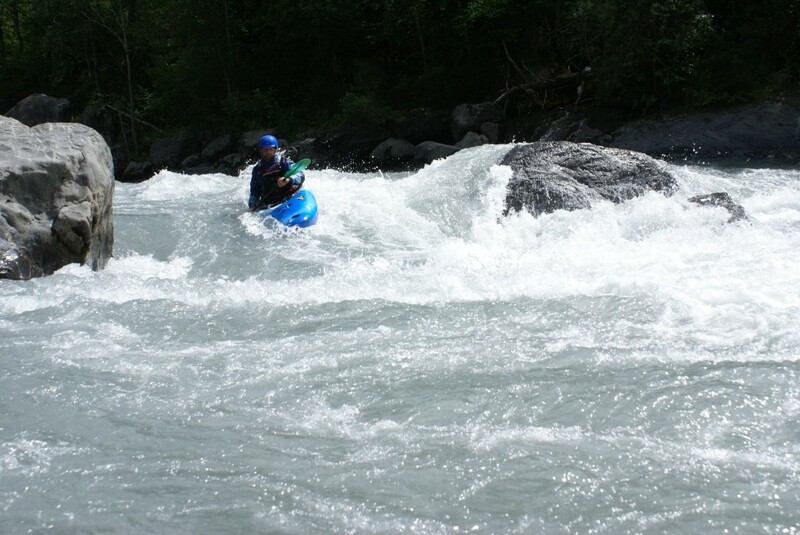 The rest of the Middle Guil went fine, until Johan capsized on the end of the Cataract passage, tried to roll at least seven times and then hit a rock and decided it was enough. A bit rocky swim took him to the bank and he was okay. I ran after his boat along the road while the others tried to keep up and get it to the shore. After a few hundred meters the boat was stuck, but unfortunately not on the shore. It was pinned before a rock and not easily reachable. After some attempts with kayaking to it and over it, it was time for some safety gear in action. After running back to the car and getting my gear, the others had already thrown a line across and were trying to get it under the boat. This worked but putting force on the rope got the rope out and not the boat. After a few minutes of trying we attached another rope, so we had 3 points we could pull on. After the second try with the 3 ropes, we decided to attach one rope to a rock, so we could pull with 3 on one rope and 3 on another. Luckily I had an 2.40m sling with me as there were no trees to attach the lines too. A big rock needed a large sling but it worked. Some heavy pulling later, the boat was free and on the move again. As we needed all the hands on the bank we had no one in the water to retrieve it. Eventually some other British kayakers 100 meters after the Tunnel Passage got it on shore. It was dented and had a crack in it, but Johan could retrieve his phone and other important Stuff, so he was happy that it was retrieved. The British who rescued Johans boat were less lucky with a lost boat and some head injury which needed a visit to the Hospital. Friday would be our last day and I wanted to end with a nice trip on the Ubaye. As it had rained and still rained when we got in, the water had risen a bit. The holes on the two passages got a bit bigger, the rest got easier and more playlike. Thomas and Arjan said they would have done it in their playboats if they had more time. As Thomas and Johan wanted to departure for Plattling and Arjan and me headed home, we parted ways after wishing them luck on the World Championships Freestyle. We drove some 6 hours until Charnay which has a nice playspot if the upstream dam is open and has correct water levels. After some big rains getting there, the dam was open and the spot was on. Not really grabby, but nice. We paddled an hour in the dark, set up tent and got up at 8 for another session. 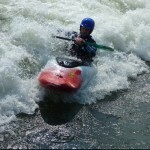 Arjan showed some loops and other cool moves, I did some flatspins and practised with getting into and out of the wave. As the waterlevels were not that great in the morning, we got out at 9 and packed up for our next stop on the way home: Metz. Metz has a nice slalom site with 2 waves and a playhole in the middle of the city. At 2.30 they opened the doors so the water got into the site. After a quick gear change I tried my first cartwheels in the hole. I got to 3 ends before my arms were totally wasted and I couldn’t hold on to my paddle. Arjan taped it on film, so will be interesting to see what I do right and wrong when setting up my moves. Around 17:00 it was time to change gear again, put the stuff in the car and drive back to Holland. Around 23:00 we were back. As I write this, Johan and Thomas are back from Plattling, so hopefully the photos will be posted online shortly. I had a great time, thanks for the opportunity to tag along! Nice Wrap Up. Only the Boat went on the shore by it self after I passed it like 500 meters below the tunnel passage. Must have been like 2 km’s I paddled behind it. Johan had bought a new boat already, a Big Dog! Ah, I hadn’t seen it happen, so assumed the other British group did it as they were there when I got there with the car. Thanks for the clarification! So Johan got a nice price for the boat then?